PEACOCK INSPIRED ART GLASS SCULPTURE home decor, jewelry, decor, decorations, electronics, fountains, floor mats, art glass, vases, garden essentials, fireplace screens. 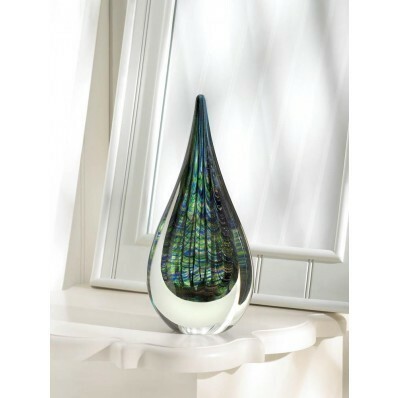 Show off your great taste in decor with this beautiful art glass sculpture. The peacock-inspired coloring features striations of green, blue and gold that will capture attention and admiration from everyone who sees it. Material(s): GLASS. Weight 4 pounds. Dimensions 4.5" x 2.5" x 10".